So it's been roughly a year for Constance Kopp working as the ladies' matron for the Bergon County Jail. In that time she has investigated crimes, tracked down murderers, sought justice for women of all walks of life, and put her life on the line more than a few times. She's gained nationwide notoriety, and caused more than a few scandals at home. About now, some of those scandals are coming back and are in the forefront of local elections. Because of New Jersey law, Sheriff Heath, Constance's boss and chief defender, cannot run for another term of office without taking one off -- so no matter what, after Election Day, Constance will have a new boss. Heath's former Sheriff is running for the position again, and is the expected winner. He finds the idea of a female deputy silly, and while he won't take Constance seriously, he'll probably leave her alone. His opponent is a current detective in the Prosecutor's office who has been opposing Constance's position and person since Day 1, he's essentially running a campaign against Heath (even if Heath isn't the opponent), and Constance is the easiest way to do that. Clearly, the future isn't bright for Deputy Kopp. While this is going on, Constance makes a couple more headlines -- she runs down a burglar single-handedly, she jumps into a river to apprehend a potential escapee under their custody when another deputy is injured. Constance has to take a woman to an insane asylum, after her husband and doctor get a judge to commit her for a while. This isn't the first time this has happened to the woman, and it seems clear to Constance that this woman is as sane as anyone. So Constance attempts to find out what's behind this commitment so she can free this woman. She's very aware of the trouble that this could cause for herself and for Sheriff Heath, she tries to do this under the radar. Under the radar isn't something that comes naturally to her, and her results aren't stellar (but better than one would expect). The story was a bit flat, honestly. A lot of things seemed to be foregone conclusions (not necessarily the way that various characters saw them working, either). The one case that she really gets herself into is really pretty tidy and doesn't take a lot of effort -- although she does take plenty of risks. So really, the novel isn't about Constance sinking her teeth into a case, into helping a woman through some sort of problem, or any of the usual things. This is primarily about Constance worrying that she'll do something to jeopardize Sheriff Heath's Congressional campaign by giving his opponents something to harp on, while contemplating her future in the jail under the upcoming term of office for either candidate. Which is fine, really -- it's just not what I've come to expect from these books -- I expected the case of the poor committed woman to take the bulk of the attention, so the problem is my own. But it comes from being conditioned by the previous books. Constance's sisters have a background role in this book -- Fleurette in particular, she's around frequently, but she plays a very small role. I appreciate that she seemed to have her head on straight and wasn't the cause for trouble (inadvertently or purposely). Norma seemed to primarily be a conduit for comic relief in this novel. But it never feels right to laugh at her, she's the most practical, she's the only realist in the family -- it's her blood, sweat and tears that's kept the family going. On the other hand, her obsessive nature does lead her into some strange preoccupations. This is not to say it's a bad book -- Stewart is probably incapable of writing a bad book. 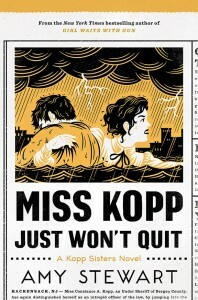 Miss Kopp Just Won't Quit feels very different than the others in the series (although, really, each has felt different than the others), and it left me feeling dissatisfied. Still, it was an entertaining and compelling read. The ending is likely the best the series has had thus far -- we just have to go through some meandering passages, and some dark times for our favorite Deputy before we get to it. I don't know what comes next for Constance Kopp (I'm deliberately not consulting anything to tell me, either) -- but it's going to be very interesting to see what Stewart does next. Disclaimer: I received this eARC from Houghton Mifflin Harcourt via NetGalley in exchange for this post -- thanks to both for this.